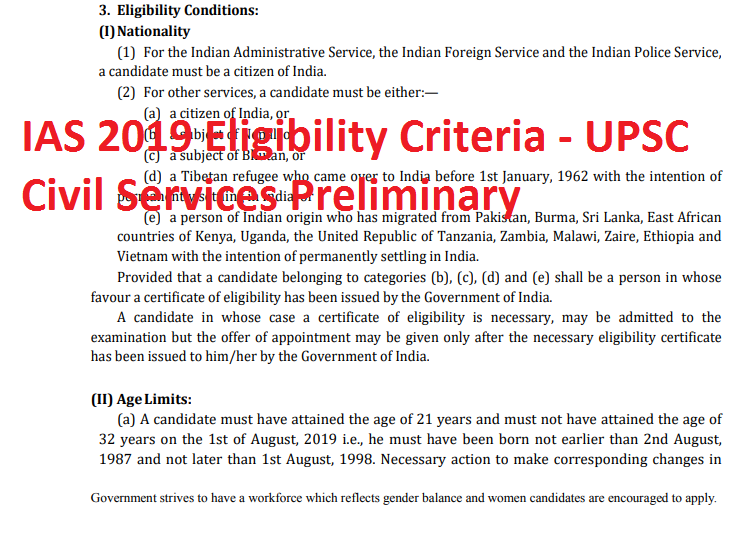 The UPSC IAS 2019 Eligibility Criteria for appearing in Civil Services 2019 Preliminary Exam has 4 main criteria based on which a candidate eligibility is determined, which are Nationality, Age Limits, Education Qualification, Number of attempts, Restrictions on applying for the examination (Indian Administrative Service or the Indian Foreign Service), Physical Standards. Details of eligibility criterias for Civil Services Preliminary (IAS 2019) Nationality, Age Limits, Education Qualification, Number of attempts, Restrictions on applying for the examination (Indian Administrative Service or the Indian Foreign Service), Physical Standards are as follows. A candidate must have attained the age of 21 years and must not have attained the age of 32 years on the 1st of August, 2019 i.e., he must have been born not earlier than 2nd August, 1987 and not later than 1st August, 1998. Necessary action to make corresponding changes in respective Rules/Regulations pertaining to various services is being taken separately. up to a maximum of five years in the case of ECOs/SSCOs who have completed an initial period of assignment of five years of Military Service as on 1st August, 2019 and whose assignment has been extended beyond five years and in whose case the Ministry of Defence issues a certificate that they can apply for civil employment and that they will be released on three months’ notice on selection from the date of receipt of offer of appointment. up to a maximum of five years if a candidate had ordinarily been domiciled in the State of Jammu and Kashmir during the period from the 1st day of January, 1980 to the 31st day of December, 1989. Provided further that candidates of Persons with Benchmark Disability will get as many attempts as are available to other candidates who do not belong to Persons with Benchmark Disability of his or her community, subject to the condition that a candidate of Persons with Benchmark Disability belonging to the General Category shall be eligible for nine attempts. Necessary action to make corresponding changes in respective Rules/regulations pertaining to various services is being taken separately. The relaxation will be available to the candidates of Persons with Benchmark Disability who are eligible to avail of reservation applicable to such candidates. A candidate who is appointed to the Indian Administrative Service or the Indian Foreign Service on the results of an earlier examination and continues to be a member of that service will not be eligible to compete at this examination. In case such a candidate is appointed to the IAS/IFS after the Preliminary Examination of Civil Services Examination, 2019 is over and he/she continues to be a member of that service, he/she shall not be eligible to appear in the Civil Services (Main) Examination, 2019 notwithstanding his/her having qualified in the Preliminary Examination, 2019. Also provided that if such a candidate is appointed to IAS/IFS after the commencement of the Civil Services (Main) Examination, 2019 but before the result thereof and continues to be a member of that service, he/she shall not be considered for appointment to any service/post on the basis of the result of this examination viz. Civil Services Examination, 2019. Candidates must be physically fit according to physical standards for admission to Civil Services Examination, 2019 as per guidelines given in Appendix-III of Rules for Examination published in the Gazette of India Extraordinary dated 19th February, 2019.